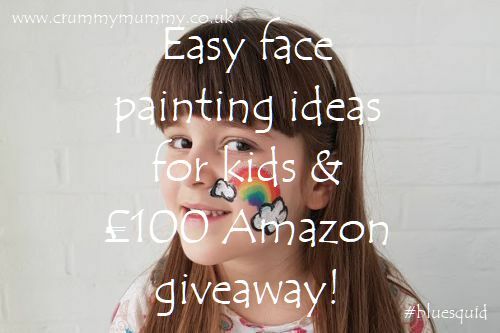 Looking for some easy face painting ideas for kids and fancy winning £100 in Amazon vouchers to kit you out with everything you need? 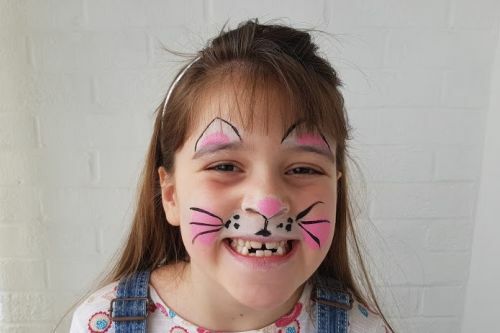 With the Easter holidays looming we’ve teamed up with Blue Squid face paints to bring you some easy face painting ideas for kids – perfect for everything from party fun to keeping them entertained in the school holidays. And there’s also the chance to win a £100 Amazon voucher or one of five runner up prizes to help you with everything you need! 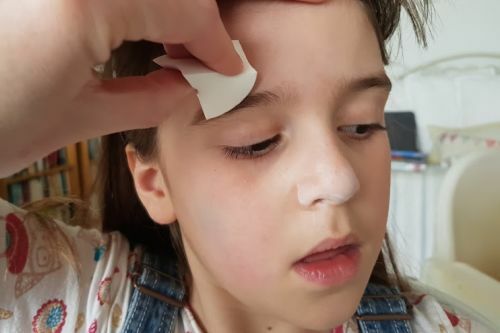 If you’re not a whizz with a paintbrush don’t panic: until writing this post I had never picked up a set of face paints and was a complete face painting novice. 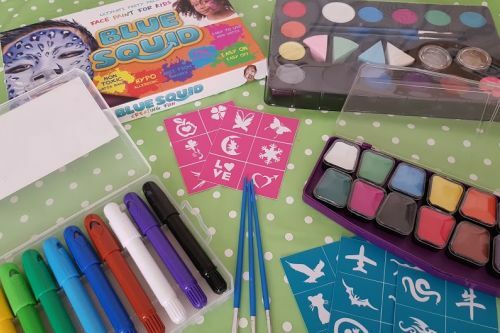 Blue Squid do a range of face paints from easy-to-use colour crayons to party packs including stencils, sponges, brushes and glitter. They’re really easy to use – you simply add water – and really easy to clean off – I simply wiped the kids’ faces with a flannel and the paint was gone. 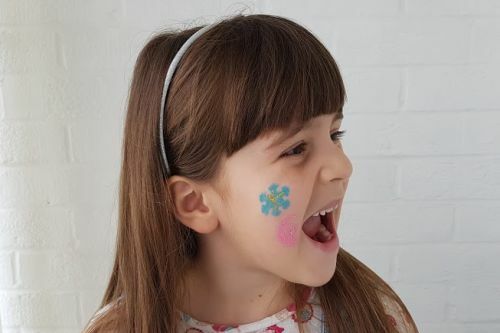 (It’s also worth noting if you have a child with sensitive skin or eczema like me that Blue Squid face paints are non toxic, water based and hypo allergenic – so perfect for delicate skin). So if you’re a total beginner like me and know the kids would love to do some face painting at home where do you start? 1. Invest in some stencils. Perfect if you’re a total beginner while you get used to using the paints, stencils allow you to decorate their face with their favourite shapes and animals. Blue Squid do a range of sticky-back stencils which you simply peel off, stick on their face, fill in with paint and peel off again. There’s everything from butterflies to dinosaurs to batman – easy peasy! 2. A cat. This one looks complicated but is actually really simple. Use your sponge to apply the base colour – white nose, ears and cheeks – then add a pink nose and ears with a brush. Finish by adding definition including whiskers with black paint and your thinnest brush. Bingo! 3. A Minion. 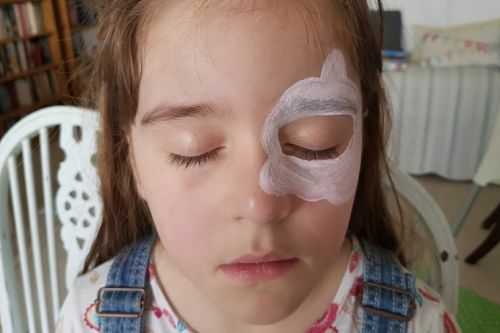 There’s no need to paint the whole face to achieve a stand-out design – it can be daunting if you’re a beginner and a nightmare if they’ve got ants in their pants and won’t sit still like my threenager. Opting for the forehead, an eye or a cheek is a great solution. Minions are super easy because they involve just three colours – white, yellow and black. Start with the white eyes and mouth, then draw the Minion itself and fill in the colour and finish with your thinnest brush by outlining everything in black. Voila! 4. A unicorn. 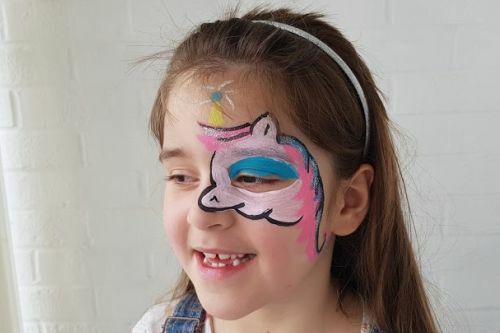 Like the cat, a unicorn looks complicated but is actually a really simple design around one eye and a great chance to get creative with glitter. For this one I started by creating my outline with white paint. Then I added pink and blue swirly hair, outlined in black, added the all-important unicorn and finished with a liberal dusting of silver glitter. Who doesn’t love a unicorn? 5. A rainbow. 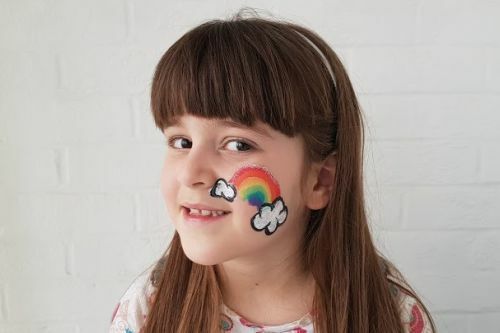 A perfect design if you’re a beginner, a rainbow is ideal for cheeks and simply involves the colours of the rainbow, a cloud at either end and some glitter. It’s bright, fun and they’re guaranteed to love it! 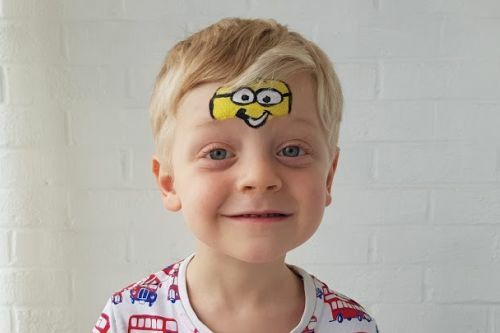 Blue Squid has hundreds more face painting ideas on their website – as well as video tutorials and downloadable pdfs to show you how to do it. 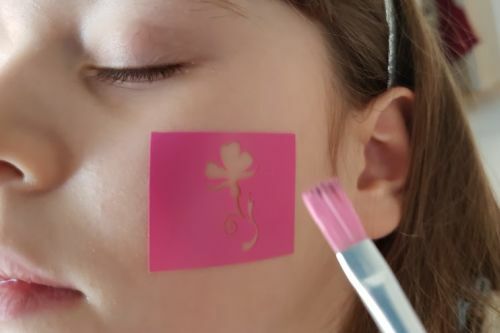 If you fancy having a go yourself we’ve teamed up with Blue Squid to offer one lucky reader the chance to win a £100 Amazon voucher to buy all you need for some face painting fun. 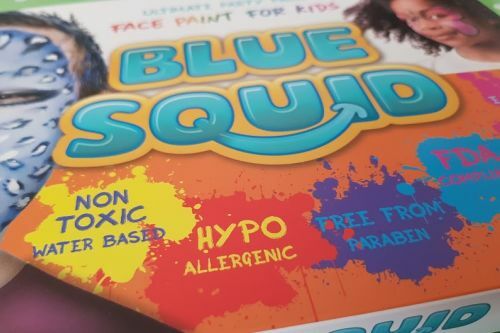 There are also five runner up prizes of Blue Squid face paints! 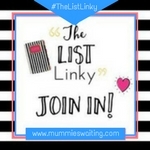 WIN a £100 Amazon voucher! All you have to do to be in with a chance of winning a £100 Amazon voucher or one of five Blue Squid runner up prizes is visit Blue Squid’s Facebook page, like and share the post below, like and follow Blue Squid’s page and comment on the post with the word ‘competition’. The competition runs from now until Good Friday, March 30 and is open to UK residents only. The winners will be announced on Blue Squid’s Facebook page on Easter Sunday, April 1. Have you had a go at face painting before? How did it go? I’d love to hear about your face painting wins – and fails!